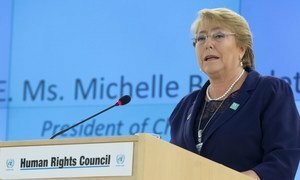 Michelle Bachelet, United Nations High Commissioner for Human Rights at the Human Rights Council 39th regular session on 10 September 2018. 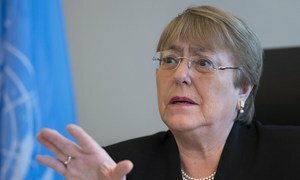 The UN’s newly appointed High Commissioner for Human Rights, Michelle Bachelet, intends to push back “centuries of prejudice and discrimination” against vulnerable groups including women and the peoples of the Global South, by pushing for more consensus between Member States, she said on Monday. Speaking for the first time at the Geneva-based Human Rights Council in her capacity as UN rights chief, she acknowledged that while political differences “may divide some of the countries in this room”, she intended to bring her “lifelong dedication to reversing hatred and ensuring equality and respect for all”. Drawing on her own country’s experience, Chile, Ms. Bachelet insisted that despite the years of dark authoritarian rule that followed a coup d’etat 45 years ago in the South American country, which profoundly affected her personally, the Chilean people now enjoy greater freedoms. She touched only briefly on the fact that she herself had been a political prisoner – and not at all on her own experience of undergoing torture – a refugee, and subsequently a doctor who cared for child victims who had been tortured, as well as being twice-elected Chile’s elected President, and being appointed the first head of UN Women, in 2011. Turning to the Council - which has faced calls for reform, not least by the United States which withdrew its membership in June – Ms. Bachelet expressed how she “deeply admired” its work, along with the UN rights “treaty” bodies which scrutinize the human rights record of every state in the world; and numerous UN-appointed independent experts and fact-finding missions. “Your expanding agenda and increased workload are not only a testament to the world's failures to uphold human rights, they are also a mark of your importance,” she said, before repeating the words of the late UN Secretary-General Kofi Annan that “no country, no matter how powerful or wealthy” can hope to solve the issues which face States in today’s complex, globalized world. While underscoring the “primary responsibility” of States to uphold the rights of their people, Ms. Bachelet emphasized that she would strive to ensure that they promoted “all human rights”: civil, political, economic, social and cultural. “Irrespective of the type of political regime in a given country, the Human Rights Council has the duty to advocate and to assist transformative improvements in upholding all rights,” Ms Bachelet said. In common with her predecessor, Zeid Ra’ad Al Hussein, the rights chief highlighted specific countries where alleged rights abuses required further international attention. These included Myanmar, where the High Commissioner welcomed the International Criminal Court’s (ICC) recent finding that it has jurisdiction over deciding responsibility for the mass exodus of Rohingya Muslims, victims of what Zeid had emphatically called “a textbook case of ethnic cleansing”. Welcoming the efforts of some Council Members to “collect, consolidate and preserve and analyse evidence of the most serious international crimes” in Myanmar, she called on the body to pass a resolution so that the UN General Assembly could endorse an independent mechanism that could complement the work of the ICC. “This is an immensely important step toward ending impunity and addressing the enormous suffering of the Rohingya people,” she said. The “impending crisis” of Syria’s Idlib was also a matter of deep concern, she continued, given the potential impact of ongoing military operations in the north-western governorate, home to nearly three million people. Turning to the issue of migration, and amid reports of violence against migrants in Germany, the new human rights chief insisted that it was in States’ interest to adopt policies that were “grounded in reality, not in panic”. In December, States are due to adopt the Global Compact on Migration, Ms Bachelet noted, a balanced human rights document that aims to reduce the vulnerabilities of the world’s 256 million migrants.